Graeme Dott hails last 16 rival Neil Robertson as "one of the best"
Coverage: Watch live on BBC One, Two, Red Button, online, mobiles and BBC Sport app from 29 November. 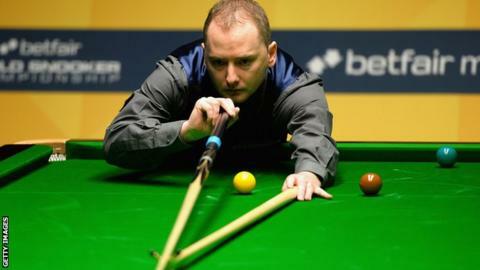 Graeme Dott reckons facing Neil Robertson is one of the toughest challenges in snooker. Dott's 6-0 thrashing of Robert Milkins set up a last 16 meeting with the 'Melbourne Machine' at the UK Championship in York. "He's one of the best," said Scot Dott. "He gets called 'The Machine' and he is, he never looks like missing when he gets in. If he pots a red you kind of accept you've lost the frame, so it's as high a standard as you can play." Defending UK champion Robertson, who beat Dott 18-13 in the final of the 2010 World Championship, sealed his last 16 berth with a 6-2 win over Peter Ebdon. And while Dott knows he faces a huge challenge against the Australian, the 2006 World Champion is feeling confident after his display against Milkins, who was suffering from an eye infection. "I played well from start to finish and that's unusual for a best of 11, there's usually something that'll happen when you have a little lull through the match or he comes back into it, but I pretty much dominated from the start," added Dott. "I think I did [hit top form] at times, probably by the fourth frame. I was dominating the game and keeping that frame tight to get to 4-0. "I only got two chances in the last two frames and made two centuries, so I can't really play a lot better. "I've been playing well and I was playing well before I came here. I'm wanting to have a go at things and I'm enjoying it." Robertson described his win over Ebdon as one of his "best performances of the season" but he knows he will have to hit the heights again to see off the 37-year-old Scot. "It looked like Graeme was playing really well [against Milkins]," said Robertson. "For whatever reason, Graeme doesn't seem to get the credit he deserves. He's a wonderful player, he can score as heavy as anyone and he's quick. "I really enjoy watching him, he's a really top player and I'm going to have to be near my best to beat him."